My plan is to retire at 40. That doesn't mean to stop working, it means to stop working for other people. I want to be financially independent so I can do whatever it is that interests me ... which of course may still be to try and earn a decent amount of money at the same time! At least I'll be enjoying whatever it is I choose to do :-) This blog is about my journey towards that goal. Wish me luck! Earlier, I posted about 5 Ways to De-Clutter and Simplify Your Life but in December, we're going to take this to the next level. Being surrounded by material possessions weighs heavily on our minds. Sometimes I wonder how big the next place I move to should be just to fit all these things in. I wonder why I keep those DVDs on my shelf that I haven't watched in ages. My wardrobe, whilst not big could do with a trim. And all those other empty appliance boxes, folders of papers and books I haven't touched in a while just sit there staring at me. And all the time, I think about doing something about these things. Over time, people generally acquire lots of stuff. Each time they move, they shift it with them and since the new place is bigger, it's easier to acquire even more stuff and have it diffuse into the house like all the other belongings. A spring clean every now and again removes parts of it, either to the charity shop or the rubbish dump but mostly, it just gets dusted and put back. Those things that haven't been used in a year or so but still being kept for the sake of it. I've managed to do this with a few things since I downsized to my newer smaller flat but I still have lots of stuff, everywhere, all over the place. It'd be nice if this wasn't the case and I could actually get rid of a lot of it. This December, I challenge you to start filtering through all those secret cupboards you have left closed for eternity, those drawers that seem completely jammed and those cardboard boxes in the attic or garage that haven't seen the daylight since the turn of the Millennium. Just a little bit here and there will make a huge difference. How much? 15-30 minutes a day. That's not much but, as with Personal Finance, many small changes add up to a large difference over the long term. Not only that, but once you've filtered your possessions you'll find it hard going back and acquiring more stuff. This not only helps your peace of mind but also your wallet. 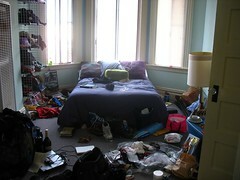 A friend told me the other day that she has three piles: Keep, Charity and Throw Out. This sounds like a good plan since then you know exactly what you're doing with every single item you find. You might like to add a Sell pile too but this is your choice. Maybe you have a Give to Nephew pile or a Recycle pile and of course, you may have others but the best way to do it is to keep it simple. Also, as and when you look at each item from that cupboard, drawer or box, make a decision there and then as to what you're going to do with it. The worst thing you can do is decide to decide later. Whatever you do, do not have a pile called Don't Know since that will just assimilate back into that stuff you didn't actually know you owned. After all, the point of this exercise if to get rid of things, not just shift them to another location in the house. As I said, pick up each item and put it into one of the definitive piles. That way, when you look at it in the future, you know exactly what you're going to do with it (assuming you haven't already done something with it already). By doing just a little bit every single day, you'll be amazed at how quickly you can get through your stuff. I shall be taking this challenge and posting one or two updates throughout the month so we can compare notes on how we're doing. You might wonder if December is a good time for doing this since it is a very busy time of year but I suspect that this will work out well for even the busiest house host. Instead of leaving all of your tidying up until a week before Christmas and New Year then just start now and see where you are in two weeks. I suspect if you did a bit every day until mid-December you'd be more ship-shape than if you left it until later. So what are you waiting for? Get sorting through that stuff and let's have a clear, clean, stress-free and simple Christmas and New Year. And remember to let me know how you're getting on in the comments, state that you're partaking in the challenge and blog about it so we can spread the word. I don't agree with not having a "don't know" pile. What I think the problem is the execution. When you create a don't know pile, you need to seal it up and date it. Come back to it in six months, and if you haven't used the stuff in there, sell them or donate them. This is a great option for a person like me who thinks I'm going to use everything again "sometime". Its been quite a shock at just how little I've needed out of my "don't know" box in three six month rounds. I've only opened the box once to remove two items. The rest - they're outta here! I think everyone has to adjust the clutter management system a little. I have a keep, sell, charity system as well as my "don't know" box. Sell is for anything going on craiglist and if it doesn't go there, freecycle and the charity pile. Good point and I do like the idea of having a date on the "Don't Know" pile. I might be persuaded to try this though I suspect I'd probably end up with everything in this pile. Certainly that's another idea to add to the collection for when people are deciding their own technique for "clutter mnagement". If You Lost Your Job, Would You be Okay? Are you Managing Your Lifestyle Inflation? Does your Bank have a Broken Business Model? Disclaimer: Retire-at-40 is a personal finance journey of a regular guy, with a regular job doing regular things. He is not a finance professional so important decisions readers might choose should not rely on this information alone (if at all). It is the recommendation of the author to seek professional advice from a financial adviser when making any finance decisions.